It’s really words written in your favorite writings, spoken in your favorite movies, and sung by your favorite singers. It’s true! Your words easily connect with world famous writings and a lot more. 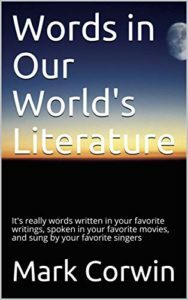 Words in Our World’s Literature is where a little knowledge acquires a better understanding of your favorite writers, writings, singers, and movies.